"In Forgiveness Made Easy, Barbara J. Hunt brings much needed clarity to one of the most important but often misunderstood dimensions of conscious living: how to genuinely live without resentment despite the abuses and injustices that life brings our way. With precision and warmth, she clarifies what forgiveness is, what it’s not, and why it’s essential for anyone who wants to break free from the entanglements of a painful past. Her simple, step-by-step process for forgiving without forgetting is a gift to the world. If you long to find the peace of letting go and moving on, this book is a must read." Many people don’t understand what forgiveness really is. Most people don’t realize that they are the one who stands to benefit the most from forgiving. Even if you know you need to forgive someone, you might not know where to begin. 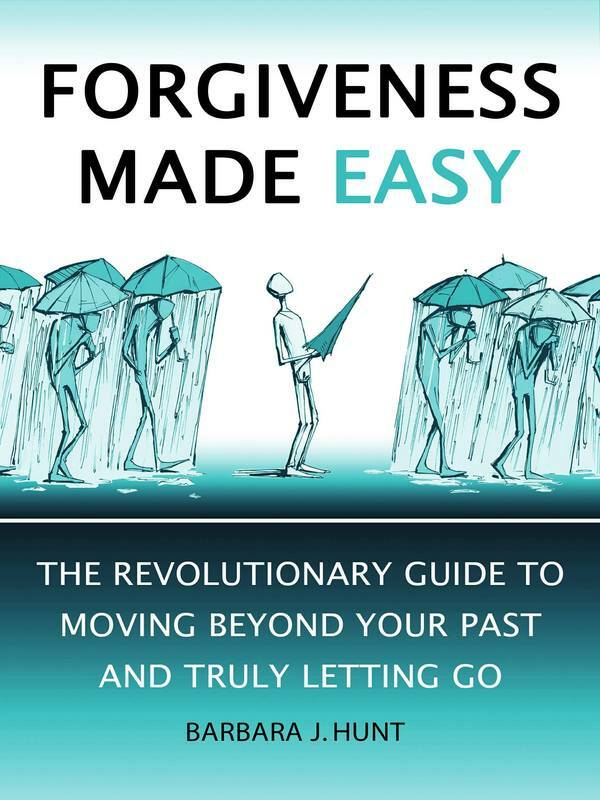 This revolutionary yet accessible guide explains what forgiveness really is - letting go of bad feelings - as well as what forgiveness isn’t and how to overcome the five most common obstacles to doing it. ​All the newest scientific studies show that there are enormous emotional, physical and mental benefits of being able to forgive. Now you don’t have to wait for time to be the great healer. You don’t even need any particular spiritual beliefs to use this straightforward mental and emotional health practice. All you need is a willingness to discover forgiveness afresh. ​"I just wanted to say that I have been so changed by the whole ‘forgiveness’ process and I wanted to thank you again for showing me how to achieve such a sense of freedom. I am an NLP Practitioner and provide therapy for a few clients alongside my full time job. I have incorporated some of the forgiveness/letting go of ill will lessons that you gave us in your workshop and have had some amazing results. This has really opened up a whole new dimension of healing, this and ‘The Journey’ have brought so much light into my life. Thank you so very much" A.M.
"This is one of most powerful books I have read in a long time. I also love that it is written in a very clear way and so it is easy to read and understand. For me letting go of resentment and being able to forgive myself and others is the key to being able to live in the present and therefore have a happier life. As a counselor, I have seen first hand how people can become so trapped by their resentments and the suffering it causes them. In my own life I decided many years ago that I would not allow long term resentments to get in the way of my being able to love and live fully. Even so, I learnt many new things in this book that will be helpful in my future practice. I highly recommend this book to anyone who wants to live a fuller life and let go of the past as well as to therapists, counselors and coaches." Forgiveness is like a superpower that hardly anyone ever uses. We might think we don't really need it at all, or it's only necessary in extreme circumstances. I believe forgiveness is the forgotten secret to creating a happy and healthy life. When you know how to let go of both your historical resentments as well as the grudges gripes and grievances of daily life, you can radically reduce your emotional baggage and free yourself of the past. Forgiveness has the potential to transform every relationship you have - with your family of origin, your partner, your kids, your colleagues, your neighbours, and with yourself. Forgiveness is essential to creating peace of mind, the key to self-acceptance and has the potential to change the world, one heart at a time. Forgiveness Made Easy is the revolutionary guide that outlines why we often find forgiveness so hard, how to overcome the five major obstacles to forgiveness and how to get all the amazing benefits of forgiveness for yourself, by using the simple seven-step Forgiveness Made Easy process in the book. ​Forgiveness is the best way of truly letting go of the past and setting yourself free forever. "This book is literally life changing. It is not the most comfortable of reads, but it is probably the most important book you will ever read. After just one week, and having done the Forgiveness Made Easy exercise with the first 3 people on my list, my mother, my mother in law and my ex-husband, i already feel so different about my whole life and all my relationships. thank you so much Barbara." "It reads beautifully and is full of wonderful insight. It's already helping me make peace with my dad. Thank you." "I absolutely loved your book." "I really found it inspiring and affirming. It articulates very well the way I've wanted to approach the world, with peace and forgiveness, but haven't been able to so easily because it was difficult to explain to myself why or how to practice those things until now."